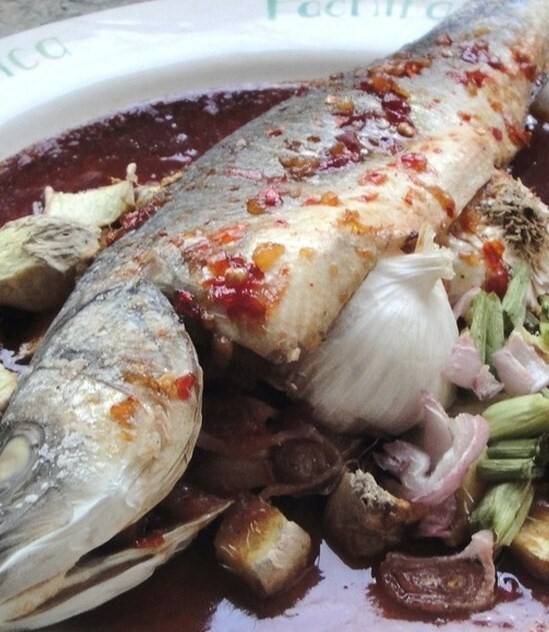 If there is one singular none shell fish seafood dish that I love above all others, it's Sea Bass done Chinese Style. 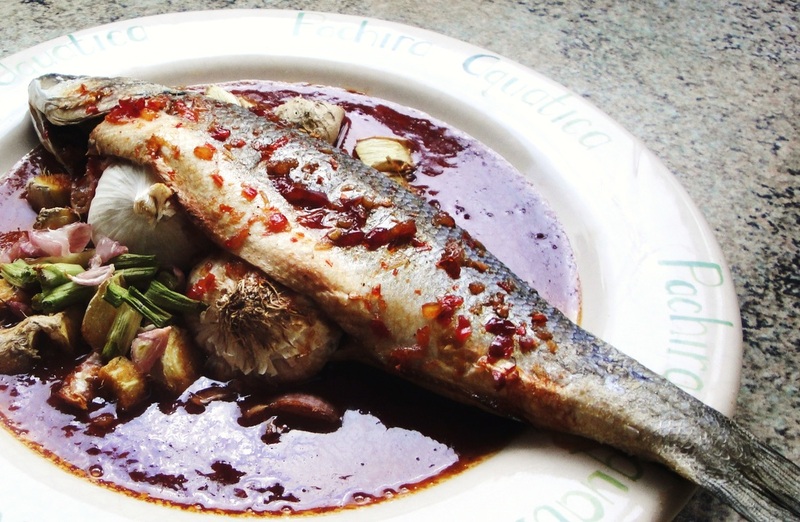 I love Sea Bass, for me it's by far the tastiest most succulent fish in the world. I first had the steamed version of this dish in a Chinese restaurant many years ago, but I hadn't ordered it. I had sampled a portion of a friend's. I instantly fell in love and tried to replicate it at home. My first attempt was luke warm. But my second attempt was bang on. My third attempt was an absolute winner. The key for me personally was to make sure the marinade for the fish was an awesome one. And it is also imperative to salt it properly, which is something I didn't do sufficiently the first time. I never seem to have much luck steaming fish, so I baked it. This is what works best for me. If you use this recipe please feel free to steam it if you wish. It's more important that you stick to the marinade, rather than stick to the technique. So what makes this marinade so great? It's the combination of all the best Chinese and Asian ingredients; Soy Sauce, Sesame Oil, Ginger (is key) Scallions (key) and a few more. I have found that I cannot live without Asian Chilli Sauce. Which is another key ingredient to this dish. Some people say it's best not to salt the fish until after it's cooked. I find that to be absolute nonsense. I salt it first-NO SALT, NO TASTE. IT'S VERY IMPORTANT TO SALT THE FISH FIRST! Whisk together 3 tbs of Chilli Sauce, 6 tbs light of Soy Sauce, 1tsp of Sesame Oil, 1 tsp black pepper, 2 tsp of red or rice wine vinegar, 2 tsp of sherry and set aside. Salt the fish generously or to your taste, sprinkle salt inside and outside the fish. You can make incisions if you like so the fish absorbs the marinade better. Place fish on an oven proof plate. Take 1 whole garlic bulb/head and cut it in half and place inside the fish. Cut up up some shallots or onions and place inside the fish. Cut up two spring onions and place inside the fish and outside. Take 8 large chunks of ginger and slice them into smaller pieces, place inside and outside the fish. The fish will be stuffed and you may run out of room, but as long as the ingredients are near to the body of the fish it will be fine. 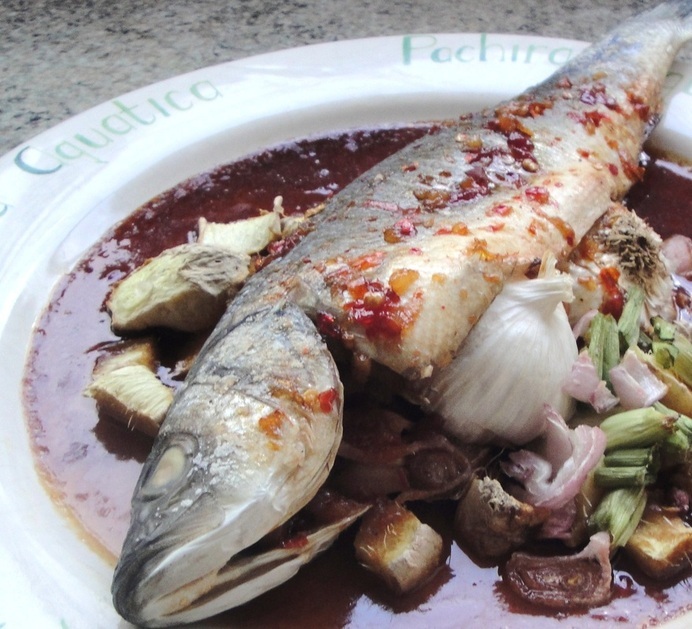 Then pour the sauce you whisked together over the fish. Let the marinated Sea Bass sit for about ten minutes and in the meantime preheat the oven (ovens vary so use a temperature suitable for your home oven) and bake for approximately 30-40 minutes (guideline only) turning halfway. Serve as desired and Bon Appetit.